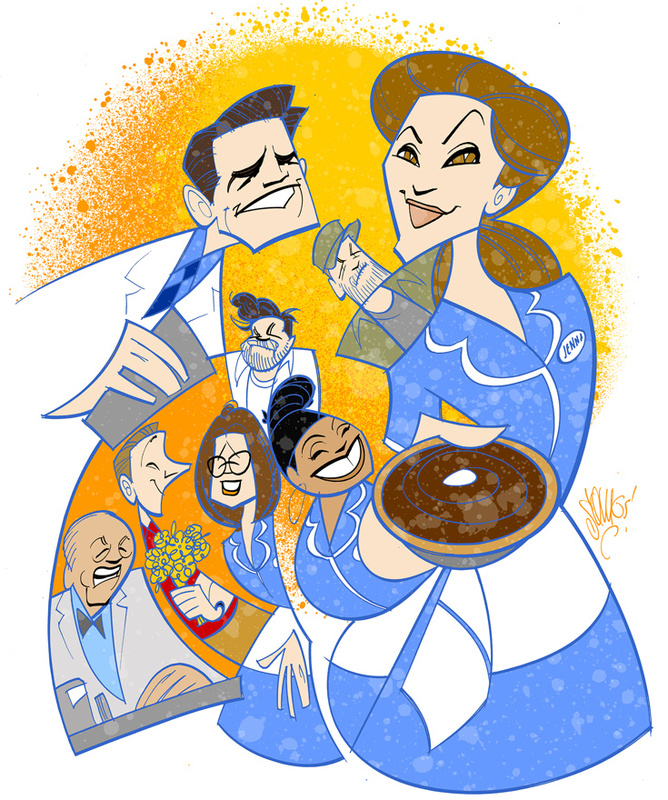 Broadway favorites Shoshana Bean and Jeremy Jordan recently stepped into the long-running hit musical Waitress at the Brooks Atkinson Theatre. The new duo takes on the lead roles of Jenna and Dr. Pomatter for a limited engagement through May 12. Bean returns to Broadway for the first time since 2006, when she concluded a celebrated run as Elphaba in Wicked. Most recently seen on Broadway in American Son, Jordan earned a Tony nomination for his turn as Jack Kelly in Newsies. In celebration of the musical's new stars, Broadway.com Resident Artist Justin "Squigs" Robertson sketched a portrait featuring Bean and Jordan romancing each other alongside a pitch-perfect company of supporting players.